The Ercoupe originated from aeronautical engineer Fred Weick and industrialist Henry Berliner. Henry invited Fred to join his privately owned Engineering Research Corporation (ERCO) to build a commercial version of an earlier Weick design, the W-1A. The prototype first flew in 1937 as the model 310, and was constructed of metal, with the outer panels of the wings covered with doped fabric to lessen weight. The fuselage aft of the cockpit consisted of four sheets of aluminium that were riveted together on the flat, and wrapped around four bulkheads. The wing structure was equally simple with a single main spar located at 25 percent chord and a small false spar where the ailerons were attached. A sheet metal cover extended round the wing leading edge, back to the aft edge of the spar. This both increased the wings structural rigidity and ensured the crucial part of the aerofoil would maintain shape. Initial test flights revealed that the basic design was sound but the designers introduced numerous refinements to optimise the character-istics. Refinements were needed in the engine mounting, the up elevator limitation, the fin arrangement and the wing filleting. The production version was assigned ERCO job No 415C and had a 12 inch longer fuselage to increase longitudinal damping. The aeroplane went into production in 1940 and was available with rudder pedals or with a simplified control without rudder pedals. Equipment offered varied between models, ranging from no radio or gyro instruments to a reasonably complete fit on the later models. A series of flight tests to trial various fillets and other design features were carried out and in the end the outer portion of the wing did not stall at all, even at full aft elevator. This was due to three factors. Firstly, the wing root so definitely stalled that the spanwise lift distribution was broken down in the centre, and the outer wing panels acted somewhat in the manner of two separate low aspect-ratio airfoils and could go up to a higher angle of attack before stalling. Secondly, the pitching moment of the main wing changed as the centre portion stalled in such a way as to tend to decrease the wings total average angle of attack. Thirdly, the loss of lift in the centre of the wing reduced the downwash on the tail, thus reducing the effectiveness of the elevator. With all three factors at work, even full aft elevator was insufficient to cause the outer portions of the wing, which in this case comprised most of it, to stall. Lateral stability and control were therefore main-tained throughout the entire range of speed and angle of attack, at least in power-off flight. With the 40hp engines these characteristics were maintained, however with the installation of the more powerful 65hp Continental engine modifications were required. The increased slipstream required a further limitation to the up elevator travel to obtain satisfac-tory power-on stalling characteristics, but then the tail could not be lowered as much as desired during take-off and landing. This problem was overcome by giving the leading edges of the wings a sharply pointed contour for a distance of a few inches adjacent to the fuselage. This caused the air passing over the wing root to break away earlier at high angles of attack even with full power on, thus returning the wings stall characteristics back to those of the earlier model. One of the more significant design changes during the flight testing stages was the replacement of the conventional single fin with twin fins and resulted from the two-control flight trials. The undercarriage is designed to allow the aeroplane to be landed crabbed, and the Ercoupe has no flaps. The US CAA (forerunner of the FAA) purchased the first four aircraft produced and gave them an exhaustive evaluation. A thorough comparison between two groups of trainees with no previous experience was carried out. One group trained in Ercoupes, the other in Piper Cubs. The results were striking, one of the Ercoupe students soloing after only two hours and fifteen minutes of dual instruction. The average time being four and a half hours. The CAA went on to reduce the time required to solo an Ercoupe from the usual eight to five. Although the first production model of the Ercoupe was ready in 1940, the war blocked further development of the project until the postwar boom, when it looked as though the little company were off and run-ning as it turned out nearly 5,000 aircraft during the first year of production. Production resumed in 1945 with models 414 E, F and G appearing between 1947 and 1949. Finally, in 1951, production ceased when the bottom dropped out. Forney Manufacturing Company acquired production rights for Engineering and Research Corporation's Ercoupe 415 two-seat light aircraft in April 1955. The first production Forney F-1 Aircoupe flew on September 1956 and it was later offered as the Fornaire Execta, Explorer, and Expediter. The rights were sold in 1960 to the city of Carlsbad, New Mexico. Air Products took over production between 1960 and 1962, and then it passed to Alon Aircraft in 1964. Alon called its airplane, still virtually unchanged from the original Ercoupe, the Aircoupe A-2. The Alon version did have rudder pedals and a modified landing gear, which on some models is a backward-bending, spring-steel gear leg rather than an oleo strut. 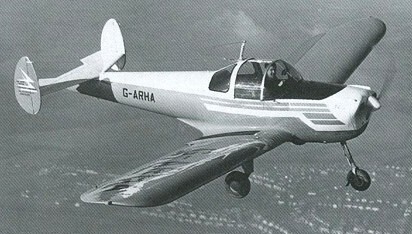 The Alon A-2 also featured a blown sliding-bubble canopy instead of the lift-up type fitted on earlier models. Alon Aircoupes had attractive upholstery, and all flight gauges were shock-mounted on a floating subpanel in front of the pilot. Dual toe brakes were standard, operated by a bar running across and above the rudder pedals. Mooney Aircraft purchased the Aircoupe rights in 1968, changed the double tail to a single tail, and sold the airplane with as the Mooney Cadet. The A-2 Cadet and M.10 Cadet were produced until 1970, when Mooney sold out to Aerostar. In 1974 Univair Aircraft Corporation purchased the type certifi-cates for the Ercoupe and all its successors from Mooney. They have since been manufacturing nearly all the airframe items necessary to keep any model ‘coupe’ airworthy. From a low point of round 2000 Ercoupes registered as airworthy in 1965, the number has recovered to round 2700 entering the nineties.